Yuriy Shishkov might be the king of bling builders at Fender Custom Shop these days. No slight to John Cruz, but damn-- the Russian is over the top lately! Especially that diamond Cabronita thing at NAMM. Anyhow, a UK based seller is currently listing this Rosewood Strat as mint with COA, candy and FCS case. Notice the body is 2 piece, sandwiching a thin maple center. The seller says this was necessary to keep the weight from being too prohibitive. Although the maple doesn't seem thick enough to matter, turns out this guitar weighs 9.5 - 10 lbs, so there ya go. He probably didn't chamber it over concern of wasting so much rosewood. Just a guess... It sure appears to like the comfortable chair. Maybe the chair could be included! 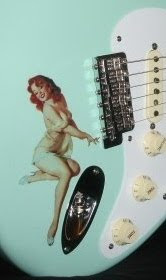 If you didn’t read this at Stratoblogster.com Guitar Blog, it’s been bootlegged! © 2013 JP Holesworth. All rights reserved. This article may not be reprinted, distributed or duplicated without author’s written permission.